There is a variety of cinematic aspect ratios, not only one. It changed and will change over time. Currently modern cinema productions using anamorphic lenses go for a 2.39:1 aspect ratio. “21:9” is a popular term and can also be found as a form factor for ultra-wide TV or monitor screens, however, it is more a marketing term and not the actual representation of the aspect ratio. 21:9 equals 2.33:1 but in reality, what is meant, is 2.37:1 which equals 64:27. If you want to create web video in ultra wide screen format (with black bars at the top / bottom) you would use 2.37:1 as the aspect ratio, e.g. 5120×2160 or 3840×1620 or 2560px by 1080px. That would be the correct setting for your editors timeline. You will not see the black bars while editing but once you are going to play it back on a device. What aspect ratio should I use? If you are creating content for commercial applications you go with what the production company’s standard is. Assuming you want to create that cinematic feel with the black bars on top and bottom, and you are creating for web content, … I would currently go with a 64:27 (2.37:1 … or commonly “21:9”) format. It is all about the ‘target platform’ and in the end you could verify what the target platform’s or monitor’s (output device) actual aspect ratio is. However, 16:9 still is a fantastic format and super suitable for TV’s and such displays, …also web content. No black cinematic bars, of course, but still a wide screen format. 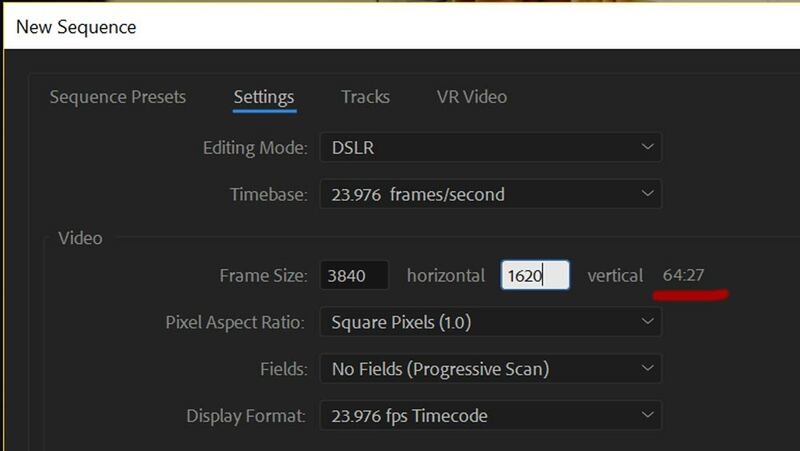 Do not ‘put black bars’ (for example with an PNG file overlay) on top and bottom of your 16:9 timeline: that is the worst solution because you do not change the 16:9 format but instead you render a real 16:9 movie with a 21:9 ‘look’. The black bars will be included in the rendering process as part of your frame and might show artifacts when rendered or played at low bitrates. Also, if played on a real ultra-wide target platform you will experience black pillars at the left and right as well because the platform will ‘box’ the 16:9 format into the 64:27 container. The only good reason to pull the ‘black bar’ trick is when you create an otherwise 16:9 video but you want to include some scenes with a cinematic look. So to say, when you showcase some cinematic scenes in a 16:9 video. To do it right: change the aspect ratio of your timeline. Check your target platform and see what exact pixel width and height it suggests. Otherwise go with a 64:27 (2.37:1) aspect ratio. Once you change the timeline you lose some footage at the top and the bottom and you got the ultra wide cinematic look. Normally you do not need to reframe the scene if you have shot it with the final ultra-wide result in mind (==keeping everything in the middle). If not, you might want to reframe the original 16:9 footage a little bit. That’s not a big deal. Next story Real Estate photography — the right dosis ‘Look and Style’ –or: how much editing is too much?